﻿ Xabi Alonso: "Some fans keep treating Cristiano Ronaldo in an unpleasant way"
08.10.2011 » Xabi Alonso: "Some fans keep treating Ronaldo in an unpleasant way"
Xabi Alonso granted an interview to "Radio Marca" where he analysed the ups and downs of a season that has just begun. Xabi Alonso confessed he's very curious to finaly see Nuri Sahin in action and also made a remark on the unpleasant way Cristiano Ronaldo has been treated by football fans across several stadiums. Xabi Alonso has been Real Madrid midfielder "maestro" over the last couple of seasons and late this week, in an interview granted to "Radio Marca", he showed his support to Cristiano Ronaldo after agreeing that some fans keep treating him in a very unpleasant way. Xabi Alonso also approached several other Real Madrid related topics and confessed he has big expectations for Nuri Sahin path and career in the club. The Spanish player started precisely by making a quick comparison on the differences between the Spanish National Team and Real Madrid. Xabi Alonso: "In Spain we have players who prefer controlling the ball more often, keep it and think about every move twice. In the other hand, in Real Madrid we have people with a more vertical game, more dangerous and prone to create one-on-one situations and we go after goals with less touches and passes. I can say that I enjoy playing in these two different styles." Regarding the Real Madrid and Barcelona rivalry, Xabi Alonso believes that his side is narrowing the gap to the Blaugranas. Xabi Alonso: "We already showed how close we are in those recent match-ups against them. Let's hope we can top them in the standings as soon as possible. I definately believe we have nothing to owe them in terms of quality and that was notorious in the Spanish Super Cup games. We could have got a better result both in the Santiago Bernabéu and Camp Nou game, but we got penalized precisely for that and lost our chances to win that trophy. I have no problems in reckonizing that Barcelona is a very good team, moreover they have Lionel Messi. However, the key aspect should be our ability to focus at ourselves and improve, without getting obsessed with anyone else." Even though a few media networks have reported that the next "Clasicos" between Real Madrid and Barcelona would be more peaceful, Xabi Alonso disagrees and predicts more tension in a near future. Xabi Alonso: "The next matches against Barcelona will have the same tense atmosphere as our previous games. Last season our games were very intense and that's the way we'll keep playing them, because we'll always give our best." Regarding the aggressiveness, Xabi Alonso says that's part of the game: "If there's contact or a few harsh tackles, we just have to accept it because this is football. Sometimes I get hit and others I'm the one tackling them, but we have to accept that with the same sportsmanship ever." With Nuri Sahin comeback very close to happen, a lot of expectations are being created towards the partnership between him and Xabi Alonso. Real Madrid could finally form a midfield duo with enough quality to control every match tempo and decide when to play in counter-attack or in a more passing style. Xabi Alonso: "Nuri Sahin has already shown several good skills. He has a good left foot, he reads the game very quickly and he has no problems in assuming responsabilities to receive the ball. Besides that, he shows a great attitude, always attempting to get along with the rest of the group and he has the motivation to be succesful. I'm excited to see Nuri Sahin starting to play for Real Madrid." said the Spanish midfielder. Nuri Sahin has been declared to be fit by Real Madrid's medical staff and is now training without limitations, attempting to regain competitive levels. Sahin can make his debut for Real Madrid in official terms, next weekend, when the Merengues will take Betis for La Liga. Xabi Alonso also showed his solidarity and support towards Cristiano Ronaldo, by pointing his finger to the fans who keep disrespecting the Portuguese player. 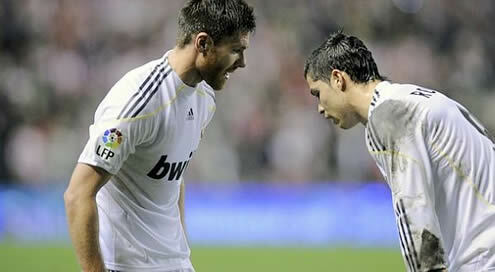 Xabi Alonso: "It's not nice to see how harsh some fans are being with Cristiano Ronaldo. It's obvious that they are not chanting and shouting nice things." The only stadium in Spain where Cristiano Ronaldo seems to have truce from fans insults and constant booing, is the Santiago Bernabéu." Cristiano Ronaldo is now preparing the decisive match against Denmark, scheduled for this Tuesday (11-10-2011). You can watch Denmark vs Portugal free streams, in our Soccer Live Streams section. The countdown clock timer, displaying the time left for the next Ronaldo game, is shown on the top right corner of all pages. This Tuesday, you'll also be able to watch Spain vs Scotland online. Next Saturday, the Premier League returns and you can follow the big rivalry clash between Liverpool vs Manchester United free. All streamings are provided from our "Live" section.